One thing this weather is good for is making things grow…..really fast. We arrived back home this morning and opened the gate to find a veritable jungle of dripping foliage and fragrant flowers. The Holboellia latifolia has gone completely berserk, with long thin tendrils flailing about above our heads. This aggressive climber was probably a mistake and is intent on turning the passageway into a tunnel, trying at every opportunity to join forces with the Trachelospermum on the opposite wall. It’s even making a bid to get indoors through the the front door. It has had one haircut already this year but needs another urgently. 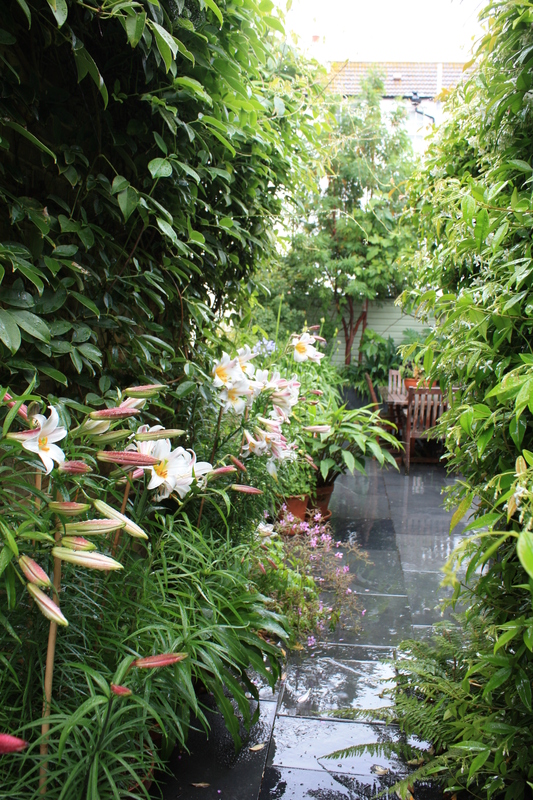 Beneath the Holboellia, lilies, gingers, cannas and Eucomis are all looking very happy indeed. The Solanum lacinatum bought at Sissinghurst two weeks ago have already doubled in size and I am excited to see how these do. In fact, the garden really suits being wet. The rain brings out the blackness of the slate and emphasises the different foliage colours so well. It’s not such a joy to be out there at the moment, but it looks great through the window. An attempt to tidy the terrace today would have been more suited to a mop than a broom and my coat still isn’t dry. But not everything is enjoying the wet. The Agapanthus look set to give their worst ever display this year, despite careful tending and regular feeding with high potash plant food. This is very possibly down to the harsh winter, but is disappointing nevertheless. At their best they produce around 80 large heads, but I think we will be lucky to have half that this year. The black petunias have had their dramatic flowers shredded and my hands are stained purple from removing the damaged flowers. A solitary bloom on my newly planted Romneya coulteri is looking more like a ball of wet paper than the elegant white poppy I was hoping for. 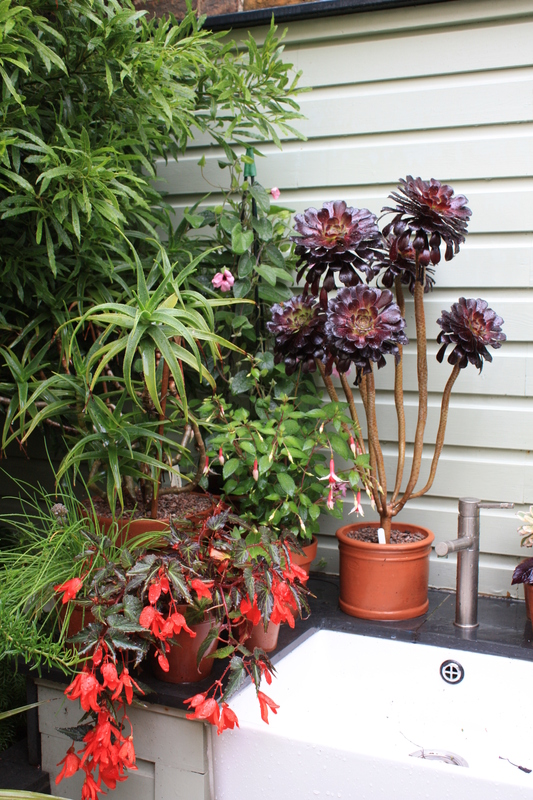 Around the kitchen sink everything is bulking up nicely and the Begonia “Million Kisses” is putting on a good show. Normally we’d be out there every evening in the summer, but I wonder if we’ll ever have the weather for outdoor entertaining this year. If the rain doesn’t stop soon we’ll need a machete just to clear a path to the door.